Hello and welcome to the 409th installment of the SWD. Unknown gunmen killed two civilians near Al-Zaatari checkpoint in the vicinity of Urum al-Kubra village, west of Aleppo. Two improvised explosive devices targeted the city of Jisr al-Shughur, reportedly killing one and wounding three civilians. Hayat Tahrir al-Sham arrested two media activists / reporters ; Ahmad al-Akhras and Rami al-Raslan in the city of Darkush, north of Jisr al-Shughur. The two activists from Kafr Nabl (Kafranbel) were reportedly arrested due to filming in an area without permission from the security forces. Hurras al-Deen and Ansar al-Tawhid (remnants of Jund al-Aqsa) issued a joint statement announcing the formation of Hilf Nusrat al-Islam alliance between the two groups. Syrian Arab Army’s artillery shelled the city of Al-Rastan in the Northern Homs pocket. According to the reports, the shelling killed and wounded seven civilians. Rebel forces in the Northern Homs pocket shelled Wadi al-Zahab and Al-Adawiya areas of the city of Homs. According to the Syrian Arab News Agency, the shelling killed one and wounded ten civilians. 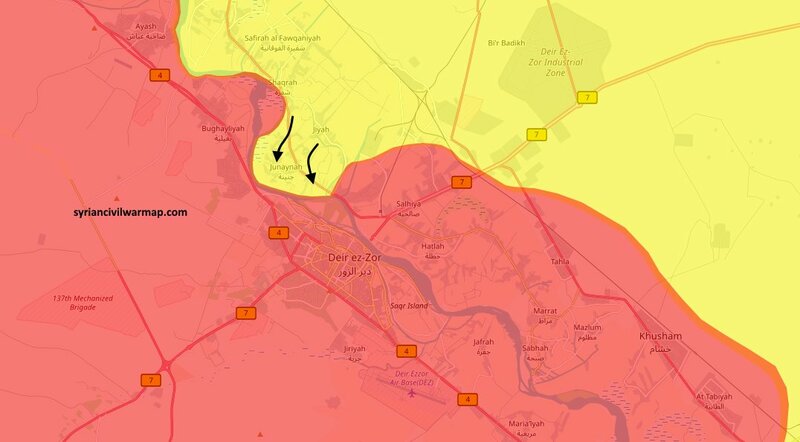 Syrian Arab Army and allies captured Al-Hisan, Al-Junaynah, Al-Jaya, Shuqra, Maishiyah, and Al-Ulyan north of Deir al-Zour from the Syrian Democratic Forces, after the latter reportedly withdrew from the localities. However, Syrian Democratic Forces, backed by the CJTF-OIR were able to recapture all of the aforementioned localities from the Syrian Arab Army and its allies. Reports suggest that four elements of the Syrian Democratic Forces were killed and six wounded, while at least 12 elements of the Syrian Arab Army and allied militias were killed in today’s clashes north of Deir al-Zour. Spokesperson for the Syrian Democratic Forces’ Al-Jazeera Storm (Asifat al-Jazeera) operation, Laila al-Abdullah stated that commander of the Syrian Democratic Forces’ Deir al-Zour Military Council, Ahmad al-Jaffal was killed in the clashes north of Deir al-Zour. Islamic State executed two of its elements in the city of Hajin, on the charges of cooperating with “infidels” (unbelievers). Syrian Arab Army and allies made limited advances against the Islamic State in Al-Hajar al-Aswad, south of Damascus. Negotiations Committees in Yalda, Babbila, and Beit Sahem reached an agreement with the Syrian government and Russia, regarding reconciliation and evacuation of rebel fighters unwilling to reconcile. Afghan National Security Forces killed eight and wounded ten elements of the Islamic Emirate of Afghanistan (Taliban) in Almar district. Islamic Emirate of Afghanistan repelled several Afghan National Security Forces’ attacks in Chaghatak and Khadaymat areas of Almar district, destroying four armored vehicles in the process. Islamic Emirate of Afghanistan’s sniper killed an element of the Afghan National Army in Shesh Tapa area of Shirin Tagab district. Similarly, an element of the Afghan National Army was wounded by a sniper in Faizabad area of Shirin Tagab district. Afghan National Security Forces killed five and wounded seven elements of the Islamic Emirate of Afghanistan in Qalay-I-Zal district. Afghan National Security Forces killed six and wounded four elements of the Islamic Emirate of Afghanistan in Tishkan district. Vehicle-borne improvised explosive device exploded near a mosque in the city of Jalalabad, capital of Nangarhar Province. Reports suggest that the explosion wounded five civilians. Islamic State’s Amaq Agency reported that the group detonated a vehicle-borne improvised explosive device near an electoral center in the city of Jalalabad, killing 20 individuals, including six elements of the Afghan National Police. Islamic Emirate of Afghanistan’s improvised explosive device killed five elements of the Afghan National Army in the city of Jalalabad. Islamic Emirate of Afghanistan attacked an Afghan National Police’s base in Khogyani district, reportedly killing three and wounding four policemen. Two Afghan National Army’s commanders; Raees Abdal and Gul Amin, as well as 24 other elements of the army defected to the Islamic Emirate of Afghanistan in Zahryano area of Qadis district. Islamic Emirate of Afghanistan’s improvised explosive device destroyed an Afghan Local Police’s motorcycle and wounded an element of the police in Kok Lam area of Kushki Kuhna district. Afghan National Security Forces killed 17 and wounded 18 elements of the Islamic Emirate of Afghanistan, as well as destroyed two vehicles and several weapons depots and ammunition caches in Khogyani (Wali Muhammadi Shahid), Andar, and Ghazni districts. Two Islamic Emirate of Afghanistan’s improvised explosive devices targeted an Afghan National Army’s patrol in Shewan area of Bala Buluk district, destroying an armored vehicle, as well as killing two and wounding five soldiers. Afghan National Security Forces killed an element of the Islamic Emirate of Afghanistan and destroyed a motorcycle in Shah Joy district. Islamic Emirate of Afghanistan overran an Afghan National Army’s checkpoint in Maktab area of Daychopan district. Five elements of the Afghan National Army were killed, while one element of the Islamic Emirate of Afghanistan was killed and two wounded in the encounter. Islamic Emirate of Afghanistan seized seven assault rifles from the checkpoint. Islamic Emirate of Afghanistan’s improvised explosive device destroyed an Afghan National Army’s armored personnel carrier and killed five soldiers in Makrak area of Mizan district. Afghan National Security Forces killed three elements of the Islamic Emirate of Afghanistan, as well as seized several weapons depots and ammunition caches in Jerashk district. Islamic Emirate of Afghanistan’s snipers killed four elements of the Afghan National Army in Nawa-I-Barakzayi and Jerashk districts. Afghan National Security Forces killed four elements of the Islamic Emirate of Afghanistan in Arghistan district.